How Do Free HEVC/H.265 Video Converters Score among Users? 1. When you play x265 HEVC video on TV via a USB drive, there's only audio but no video image or the screen goes black, which you understand it's the HEVC not playing problem. 2. Playing your 4K HEVC video in .mkv on your Windows 10 doesn't make a scoop, it stutters or freezes. Nothing magic happens even if you jump to another time (like from 1:03 to 5:27). 3. You have HEVC player that plays H.265 just fine but your friends you want to share the H.265 encoded videos with, do not. 4. Or your H.264 files ripping from your DVD disc or Blu-ray disc are excellent in quality but occupy too much disk space on your computer. You just want to clear some space for your movie library. Actually, all the troubles can be fixed by the same silver bullet - an HEVC converter. 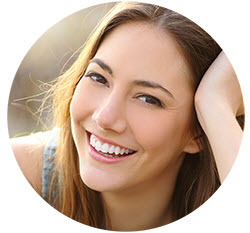 By using the h265 video converter (freeware is preferrable), you can successfully and freely convert H265 to H264 MP4 for smooth playback on TV, computer, mobile device without incompatibility issue and also encode H264 to HEVC/H.265 files with smaller file size (40%-50% weight off). Now that the free h265 HEVC video converter is the key, seize time to find a solid tool. Yet, how to judge if it's a helpful HEVC video transcoder freeware since most of product reviews are exaggerated by their promotional workers? Easy. Don't listen to what they say, instead listen to what common users say. 1. Completely free but no 3rd-party software, adds-ons, adware, or malware. 2. Intuitive interface that directs you to transcode HEVC videos without hassle. 3. Support a wide range of input and output formats (MP4, H.264, MKV, AVI, WMV, 3GP, DivX, Xvid, WMV, webm, etc) that are not limited to H.265/HEVC. 4. Fast HEVC converting speed and no dramatic quality degradation. 5. Ready your HEVC clips for diversified media players, mobile phones, tablets, gaming systems, tvs, and more and make them even shareable on YouTube or so. The 27-year-old Mike has bought a TV recently, which supports HEVC codec playback with .mp4. Unfortunately, the movies Mike download from online HEVC movie sites are formatted mostly in MKV format. Hence, he needs to convert HEVC .mkv video to .mp4. Mike tried Handbrake as the free HEVC converter. But he eventually found it did 25 hours per HEVC/H.265 decoding/encoding. Well, following his friends' recommendation, Mike meets MacX Video Converter Pro. Convert any video to HEVC/H.265 with 370+ codecs supported , covering 4K MKV, MP4, DivX, Xvid, VP9, VP8, MPEG-2, and more. Decode H.265/HEVC to H.264, MP4, MKV, MPEG-4, MOV, AVI, FLV, etc swiftly with high quality reserved. Compress large 4K UHD files into smaller one and save the videos encoded with HEVC to release more room for your Mac hard drive and new iOS 11 devices. Transcode HEVC/H.265 videos to a format acceptable by older iPhones, iPads, Android Samsung, PSP, TVs and more, with 410+ device profiles infused. HEVC decoding and encoding are always regarded as a complicated task with tool such as xh265. But MacX Video Converter Pro's straightforward interface really amazes Mike. Just within 4 simple clicks, you can convert videos to/from HEVC at a skyrocketing speed without any hassle. Run this HEVC video converter on your Mac/PC after you get the tool installed on your computer. Step 2: Add your files. Click "Videos" button to import your HEVC video files. Or just drag and drop H265 files into this H265 to MP4 converter. You can also add other types of videos to this tool for video conversion like AVC HD, MOV, M4V, MKV (VP9/VP8/H265/H264), VOB, FLV, AVI, MPEG-2, etc. It supports almost all the video formats in whatever video codecs. Customized profiles are infused in the program, with video codec, resolution and other parameter settings already set. It won't take you too much time to choose the desired one. Go and find "Mac General Video" > "MP4 Video (HEVC)". Optionally, you can go back to main interface to click settings icon , where the video resolution is available for you to adjust up to 4K 2160p. Afterwards, tap "OK". Click "Edit" icon and you will enter the HEVC video editing zone, where you can shorten 4K HEVC length, cut off unneeded HEVC image border, add subtitles, rotate HEVC orientation and so on with the help of this HEVC editor. Hit "RUN" button and it will begin to convert H265 to MP4 with Intel QSV hardware accelerated speed, along with mutli-core CPU (up to 8) and hyper-threading tech. A video conversion window will pop up to show you the copy processing, the FPS, time remaining, etc. The sunshine Aniston from England is a travel enthusiast, who captures beautiful sceneries using Samsung NX500. This time, when she puts 4K H.265 videos to her computer, but there isn't any image when opening them. So she posted on forums and wonders if she needs an H265 to H264 converter to transcode HEVC x265 videos. Zealous net friends recommended her with FFmpeg and Handbrake. Finnally, Handbrake won the game, because FFmpeg kept quitting automatically the moment Aniston tries to install it on PC. So she turned to Handbrake and luckily Handbrake didn't let her down. Despite of its long video source loading time and no technical support, Handbrake is still well-known among users. It's an open-source and free video converter for HEVC and H.264 encoded MKV and MP4. The latest version expands its device profiles, not limited to HEVC MKV, but also iPhone, iPad, Web, playstation, Roku, Chromecast, Fire TV, etc. In the meantime, it is also skilled in ripping homemade DVD to MP4 with HEVC or H.264 codec. Just simple 5 steps, Handbrake successfully and freely converts 4K H.265 to H.264 at a lower resolution 1080p, although the process is not so fast as she imagines. And if you wanna free transcode x265 to x264 (4K to 1080p), you can click the Handbrake HEVC guide or follow the tutorial below to convert HEVC video to more compatible H.264 video file. Go to Handbrake official page and download the specific version as per your needs. Handbrake now works with 64-bit Windows 7 or later and macOS up to Sirra. Click the File button on the top left side to load the HEVC file. Handbrake generally needs more than 3 seconds to scan the file. So just wait patiently. Go to the Destination and tap the Browse to decide a folder to save the converted HEVC video. Go to Output settings and choose MP4 as the output container. 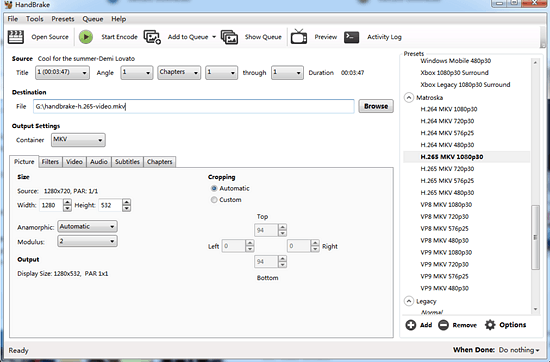 Generally, Handbrake will automatically choose H.264 as the video codec. Then up the video resolution to 1080p in the Picture settings. If you want to stay H.265 unchanged, go to Video and choose H.265 (x265) as the output video codec. You can also tweak the settings, like framerate, quality, avg Bitrate, encoder tune, etc according to your needs. Or directly go to the Presets profile on the right side, where Handbrake offers General, Web, Devices, Matroska and Legacy available for you to choose. Click Start and begin the HEVC video conversion. The Colombian part-time model has been asked to send catwalk videos to her manager. But the manager claimed that she couldn't open these HEVC catwalk videos but only audio. She resorted to Reddit and used Any Video Converter for help, intended to convert H265 HEVC to H264 with MP4, MOV or MKV container format. Beyond her expectation, the free HEVC/H.265 video converter works great, letting her bulk decode H265 to h264 at one stroke. AVC is free to use, with 100+ inputs and 160+ outputs. It accepts virtually any video files and gives you the power to convert video to HEVC that is about half the size of AVC and also delivers better image quality. Since compatibility is still a huge downside to encode your media library into HEVC, you will also at your disposal to decode the go-to video compression standard H.265 to H.264 so that you can play the HEVC video on more devices. However, you will be asked to buy its Pro version after each HEVC conversion. This is somehow annoying. Step 1: Free download and install the HEVC video converter, then launch it. Step 2: Click "Add Videos" or "Add or Drag Files" button to load the HEVC file. 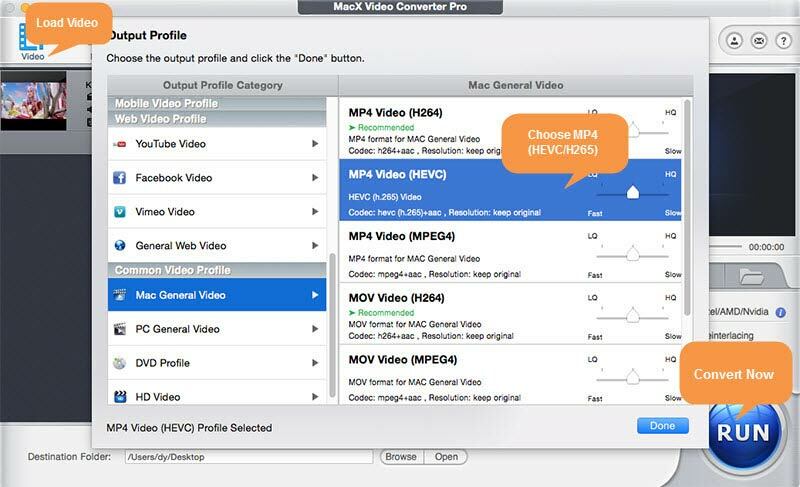 Like MacX Video Converter Pro, Any Video Converter also supports batch converting and merge HEVC video files. Step 3: Select the output format from the Output Profile drop-down format list. 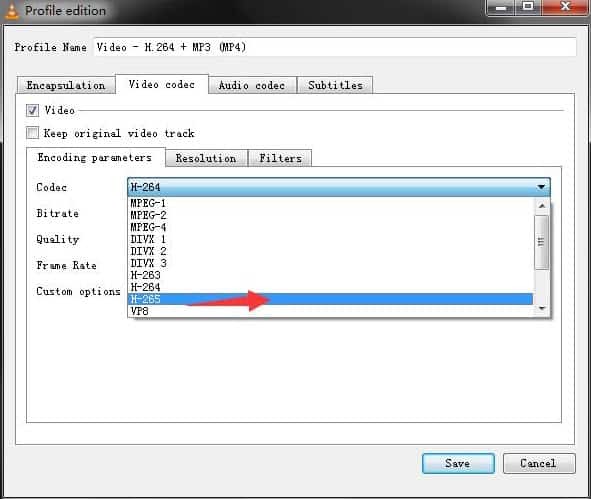 Choose x264 MP4 as the video codec under Video Option. 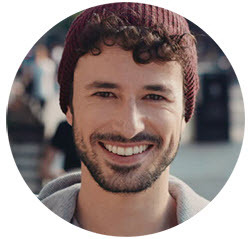 Step 4: Click Convert Now to begin converting H.265 video files to H.264. 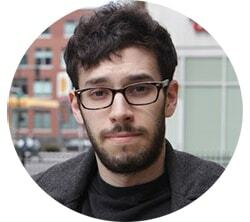 The spanish young man Ryan is a movie buff, who has digitized the mountain of DVD movie collection into h.264 rips. What makes him depressed is that these movie library are too large for his iPhone 7's 32GB storage space. He plans to free compress and convert H.264 to H.265 in expectation to reduce the file size about 40%-50% off. Despite H.264 playback is acceptable by PCs, phones, tablets, media players and game consoles, video encoded with H.264 occupies twice as large as that in HEVC. Ryan thinks of VLC media player, which is said to have video conversion feature, as well. Followed by a click on "Add" to import H264 movie files. This free x265 HEVC converter successfully caters to his H.264 to H.265/HEVC video converting needs. Step 1: Launch VLC and choose "Convert/Save" option under "Media" category. Step 2: Followed by a click on "Add" to import the H.264 movie files. This free x265 HEVC converter supports to batch load video files. You can imports more files at one go. You can also select the video file and tap "Remove" to delete the file if you wrongly pick it. Step 3: Tap "Convert/Save" at the bottom of the interface. 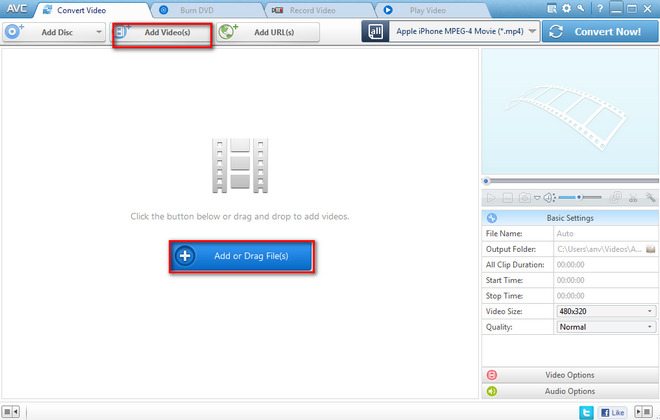 Step 4: Select "Video - H.265+MP3 (MP4)" as the output format from the drop-down window. Generally, there is only H.265 MP4 profile in the Profile zone but no H.265 MKV profile. No biggie. VLC media player allows you to free create a profile with HEVC MKV format. Opt for the profile "Video - H265 + MP3 (MP4)" > Click the edit icon with a spanner icon to edit the selected profile. > On the pop-up window, click MKV under "Encapsulation" column. > Type a new name on the top profile name. > Hit "Save" and it goes back to previous interface, where you can set the created profile as output format. Taps "Browse" to choose destination file. > Press "Start" and this free HEVC encoder begins to free transcode MKV H264 to MKV H265. Note: Only VLC windows version is available as a HEVC converter to encode H.264 to H.265. The Mac version won't facilitate you to fulfill the task. Free download this top H265/HEVC video converter to easily convert H265 (HEVC) to H264 in MP4, MKV, MOV, AVC formats or compress H264 to H265 on Windows and macOS. Also support you to convert any video to 4K MP4, 2K MP4, SWF, AVI, FLV, WMV, MPEG, VP8, VP9 and iPhone X, iPhone 8/Plus/7/6s/6, iPads, Android. Can VLC Play All HEVC/H265 (4K) Videos? HEVC Encoder is Enough?